Just a little update for everyone on the mourning Ten front. After “The Beast Below,” I think I’ve finally reached acceptance. The episode was remarkably well written, funny, and poignant, and Amy and Eleven are starting to develop a relationship that is different from anything we’ve seen before. (Somehow Amy manages to create more sexual tension than Rose while maintaining the can-do, take no prisoners attitude of Donna. I think I might be in love with her.) Matt Smith’s Eleven ain’t too shabby either. He is at once an old man and a child and manages to pull of the condescending tone we’re used to from Doctors like One and still be unbelievably lovable. But what really helped me heal was this interview from the AV Club. In it, Matt Smith shows this amazing sensitivity and charm (plus he reveals he was a soccer player, another plus for me). He is humbled by the role, and just intimidated enough to do a good job. AVC: Based on “The Eleventh Hour,” it seems like if anything is starting to set you apart, it’s that you use a lot more physical movement to your performance as The Doctor. Is it tough to be physical in tweed? MS: [Laughs.] I don’t know, man. I think tweed lends itself to being physical, because it looks just a bit odd. I do hope he’s quite a physical Doctor, because I think that’s quite an interesting way to play the comedy of it, actually. I’ve always been interested in physical actors like Peter Sellers. I’ve always been interested in the body. There’s a French [performer and acting instructor] called Jacques Lecoq who’s always interested me, his theories and stuff. So I hope I continue to explore his mad physical side, because it’s this alien inhabiting a human body. It’s quite an odd concept. AVC: You were an athlete before you were an actor, right? MS: Yeah, I was a footballer. AVC: Do you draw on that at all? MS: Yeah, definitely. I think there are definite parallels between sport and art. There’s a real sense of sacrifice. There’s a real sense of dedication that is needed in sport that I think you can attribute to art. I think so much of it is about bravery and courage, being an actor. I think similarly, these things can be applied in artistic roles. It’s about having the courage to follow your instincts, and also having the discipline and dedication to sacrifice the things in your life that you need to sacrifice to get the best out of yourself artistically. So I learned a lot of valuable lessons as a sportsman. AVC: The series can be any genre from week to week. Have you found, at this early stage, a preference for a certain type of episode? MS: No. I guess one of the great liberations as an actor is that the show can go anywhere and do anything and be anyone. It’s ever-changing, and the worlds are completely ever-changing. There’s never any world that you can’t inhabit. I like the fact that it’s always changing. Once every 12 days, you’re in the future, then in the past. We filmed an episode called “Vampires In Venice.” We filmed it in Croatia, and that was rather wonderful. But then, of course, we went way into the future, and the sets are just mad. AVC: Doctor Who has always been more of a cult sensation here in the U.S. than in Britain. How would you describe the series to someone here who has never seen it before? What would you say it’s like? MS: I’d say it’s about a 900-year-old alien who travels around time and space in a blue police box, which is called the TARDIS, having adventures, saving the world, and defeating evil. It’s not bound by space or time or logic or genre, and therefore creatively it can go anywhere and do anything. You can be in the past with dinosaurs one week and in the future the next week, as the world is about to explode. I think it’s full of heart and humor and wit and invention. I think Doctor Who improves your life. And I mean that. It’s not just, like, my mission statement. I do, as a man who’s come to it late on, as well. It’s never too late to get into it. I think we’ve got a new team and a new show, and I think now is the time to start watching. I totally agree, Matt. I totally agree. but I’m getting more used to our new Time Lord. I mean, how could you say no to that devilish glint in his eye? See what I mean. Wild eyes. with the sleek haired manic-depressive kid from the obscure British TV show. Oh 1994. You make even David Tennant look awkward. 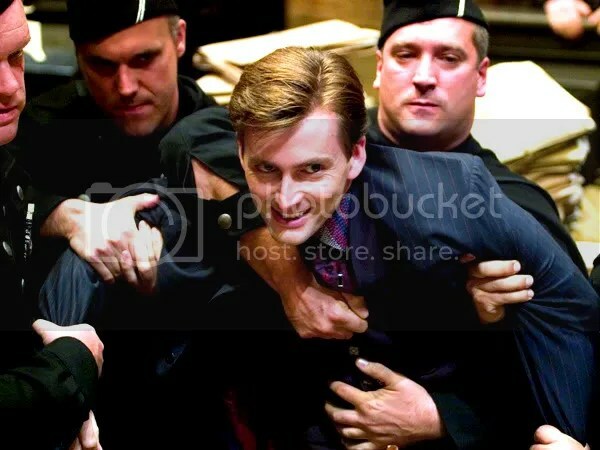 The point is, David Tennant’s Tenth Doctor was one of the most powerful characters on television, mostly thanks to the combination of Tennant’s comprehensive RSC training and his good-natured love of all things geek. D10 is tragic, witty, charismatic, and terrifying. Mercurial in the truest sense. I’ll admit my crush is stupid, a combination of my love for anyone who can handle Shakespeare well and my love for sci-fi, but there’s a real sense of loss here, and I’m not the only one feeling it. As evidenced by the current trends in this poll in The Guardian, as much as io9 wants to say that we’ve forgotten D10, a lot of us are still recovering. So, without further ado, here are the Five Stages of Grief for Doctor Who.